Famous for the castle-like rock formation looming 90 meters high above the town, Ortahisar, or Middle Castle, is, well, right in the middle of the Cappadocian towns of Goreme, Urgup, Uchisar, and Neveshir. Though it is becoming more popular with visitors, Ortahisar is still a quiet farming town that’s sleepier than many of the other Cappadocian hotspots that are today bursting with boutique hotels. Life in Ortahisar is based around the cobbled streets which extend from the central square, and wandering the streets lined with stone houses is a great way to get a taste of life in a traditional Cappadocian town. The town is also known for the Culture Museum Restaurant, where a series of dioramas in the upstairs room displays traditional life in Cappadocia, while downstairs the restaurant isn’t a sideline next to the gift shop, it’s in the actual museum. Just a few kilometers is a museum of another kind, Goreme Open Air Museum. You can walk there from Ortahisar if you have good hiking legs! Also, 1km northeast of the town center, you can visit Hallacdere Monastery where intriguing animal heads are sculpted on the walls. Located only a few kilometers southeast of Goreme, there’s an ATM at Orthahisar’s main square, and a number of good hiking trails lead out from town. Journey to Cappadocia for a comprehensive one day small group tour of Rose Valley, Ortahisar, Kaymakli Underground City and Pigeon Valley. 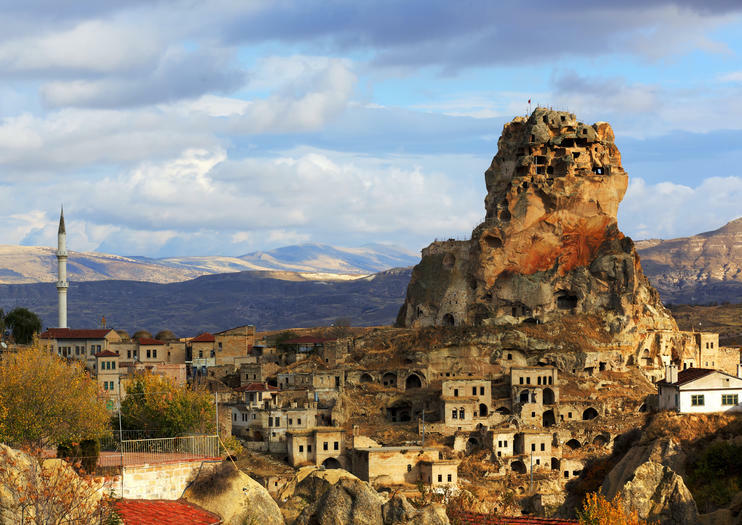 With plenty of attention from your local guide discover this otherworldly UNESCO World Heritage region famous for its mushroom topped pinnacles, subsurface cities and cave carved ‘fairy chimneys.’ During this tour, stroll the verdant Rose Valley, visit the deserted village of Çavuşin, marvel at Ortahisar Castle, explore Kaymakli Underground City and admire stunning volcanic monoliths at Pigeon Valley. This small-group tour is limited to 20 people so you can enjoy extra attention from your guide.